In 2008 I became very ill. I lost my hair as if I had been given chemotherapy, had severe headaches, my body ached to a point where I knew I was dying. I found out I had Celiac Disease (meaning I can't eat wheat) which had caused my intestinal lining to tear which caused everything I ate to spill into my bloodstream and then my body started attacking itself (an autoimmune condition). I removed the wheat, eliminated all toxic processed foods from my diet and made my health a priority. I have recovered and my hair is growing back nicely. I realize how much I took my hair for granted after I lost it. I had a beautiful head of hair but never worried much about treating it with the respect it deserved. I used whatever cheap products I could find, applied heat, relaxed it with chemicals, etc. To heal my "sick hair" (as I call it) I started to research the best practices including using healthy natural ingredients vs. chemically based ingredients so sites like Naturally Curly have been a godsend in the last couple of years. A friend of mine who has natural hair told me to use a tshirt and ditch the terry cloth towel for hair drying. I adopted this practice immediately and saw a huge difference in just the first week. Six months later the idea for The Original Curly Tee Towel popped in my head and it has taken off from there. When making the Curly Tee Towels, I saw quite a bit of left over material. I often wear a wig as a protective style but noticed how dry my hair would be using those synthetic wig caps. I knew how wonderful cotton was to dry the hair and thought that a wig cap made out of the same material could help with that. 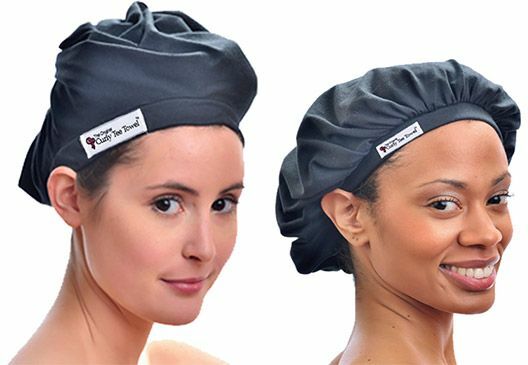 I searched online and found one company that sold a basic wig cap made of cotton primarily to women who had chemo. I asked my seamstress at the time to make one similar to that to try. She did and I was amazed at how my hair retained its moisture and condition under my wig. I now won't use anything else. I also eliminated the fake satin bonnets (which also dry the hair/strip natural oils) by replacing them with a sleep bonnet made out of cotton (also one of our products). Real satin is made from silk. Fake satin is manufactured from nylon or polyester and these fabrics just don't absorb and contain moisture well. A prime example of this is when trying to clean up a liquid spill with a polyester cloth, the liquid either runs right through the fabric or it just moves the liquid around. 100% Cotton will absorb and contain the liquid and does the same thing with moisturizing products on the hair. The Curly Tee Wig Caps are so soft and nourishing to the scalp. Just like we don't want to use a terry cloth towel to dry our hair, when we use other man-made fibers or something rough on the scalp where new hair is trying to come back, we want to make absolutely certain we are not irritating the hair follicle or the new hair growth. The caps just add a safe layer of protection between the hats, scarves and wigs. The most important tip for regrowth after chemo or other health issues is to pay attention to what you eat. After a compromised immune system, I didn't have the luxury to eat a lot of the same junk foods that I had eaten previously before my illness. Since I had become sick from something I ate, I researched and found out the exorbitant amount of chemicals, pesticides, etc. that is in our food supply, so the last thing I wanted to do was add additional toxins to my body, so I now chose to consume fresh "organic" vegetables and fruits, I gave up entirely my meat, fish and poultry intake (if you can't quit try to reduce) and I went easy on my digestive system, meaning I ate small meals more often during the day and left ample time to digest what I ate. I incorporated a scalp care regimen which included nightly scalp massages and various herbal tea scalp rinses. Two of my favorites to this day are nettles and rosemary that I still use today. One of the more radical things that I added was inversions. I had seen several youtube videos on inversions for hair growth so I bought an inversion table and hang upside down two times a day now. This has accelerated my hair growth tremendously. A huge thing for me during my regrowth stage up until now is to maintain a positive attitude. In the beginning it was devastating to look in the mirror and see my hair gone. What helped me get through was gratitude. I would journal 5 - 10 things daily that I was grateful for. Sure my hair was gone but I was still breathing with great family and friends who were happy to see me get better. I stopped taking life for granted and it seems that once I took my focus off what I didn't like when I looked in the mirror, my hair said, "Okay, it's time to grow back now"...In 2011 I chopped off all of what I called my "sick hair" and it's been growing great ever since. I still haven't reached the thickness I desire because I had so many bald spots, my hair is catching up. So I trim when needed and continue my protective styling. Have you or has someone you know lost their hair to illness or treatment of an illness? We are giving away 10 Curly Tee Wig Caps, just leave a comment below and we will randomly select 10 winners on Tuesday, November 11. *Please make sure you have liked us on Facebook, so that when we reply to your winning comment you receive a notification. This article was written by Jaie Benson, the creator of Curly Tee Towels. Thank you Jaie for sharing your story and donating your Wig Caps to our community!